NETWORK FINALS: Because THE MICK aired twice on the west coast, at both 5PM and 8PM, it adjusted up a healthy 0.4 to 2.8. SUNDAY NIGHT FOOTBALL adjusted to 7.4, up a point from the Christmas night game. RANSOM, however, lost 0.1 in final numbers, and the FAMILY GUY rerun dropped 0.1, while the NCIS: LA rerun gained the same. 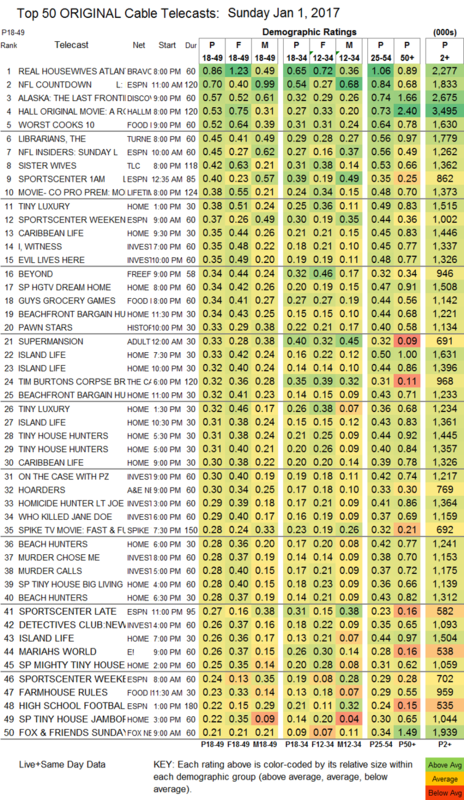 CABLE HIGHLIGHTS: With no cable sports to speak of on New Year’s Day, and no new programming on networks like HBO and AMC, the night was led by Bravo’s REAL HOUSEWIVES OF ATLANTA, down 0.21 from its last airing 2 weeks ago to 0.86. Discovery’s ALASKA: THE LAST FRONTIER was down 0.03 from its last episode to 0.57. The holidays haven’t ended at Hallmark, where the original movie A ROSE FOR CHRISTMAS scored 0.53. Food Network’s WORST COOKS was at 0.52, and GUY’S GROCERY GAMES was up 0.07 to 0.34. TNT’s THE LIBRARIANS, which did air on Christmas night, rose 0.04 to 0.45. TLC’s SISTER WIVES slipped 0.02 to 0.42, and MARRIED BY MOM & DAD was down 0.03 to 0.13. Lifetime’s movie MOMMY, I DIDN’T DO IT was at 0.38. On ID, both I, WITNESS and EVIL LIVES HERE were at 0.35. Freeform aired a “preview” of the opening hour to its Monday series BEYOND at a fair 0.34, although that number doesn’t look as good in the context of the 0.67/0.54 HARRY POTTER movies that hammocked it. An episode of History’s PAWN STARS was at 0.33. Adult Swim’s late-night SUPERMANSION was at 0.33. 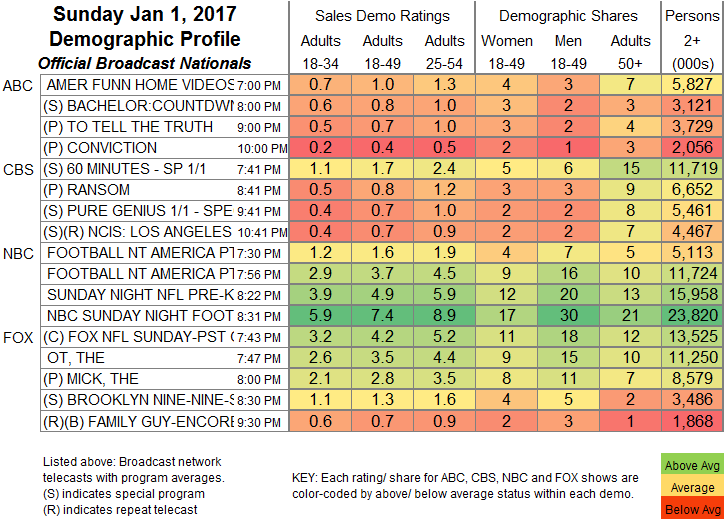 On E!, MARIAH’S WORLD didn’t get any bump from Carey’s New Year’s Eve singing flop, down 0.07 to 0.26, and THE ROYALS ticked down to 0.20. Showtime’s THE AFFAIR, returning after a week off and without a lead-in from SHAMELESS, fell 0.09 to 0.13.